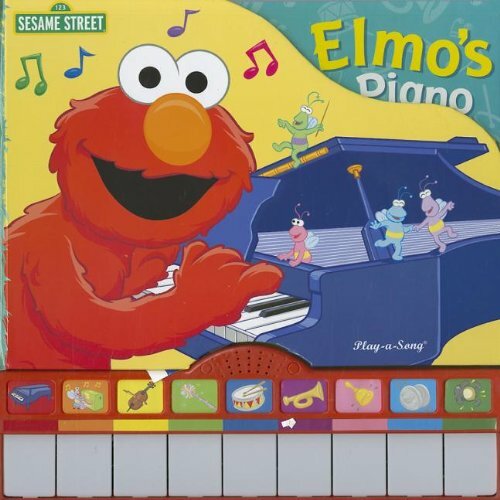 The Sesame Street Song Book: Elmo's Piano is an interactive songbook that features a toy piano keyboard. Children can develop their musical skills and hand-eye coordination by playing tunes with Elmo and other popular Sesame Street characters. This entertaining and educational book is designed for children ages 18 months and older. Each page features lyrics that are set to a familiar song and a simplified version of the melody's sheet music; children can use the keyboard to play along with the melody. The pages are displayed horizontally, which means that they rest directly over the piano keys. When the child presses an icon button, a melody will play. At the same time, a bright LED for each key lights up in sync with the melody so that children can follow along with their fingers. The Sesame Street Song Book: Elmo's Piano has a sturdy cover and heavy board pages that withstand rough handling. Children can prop up the book s front cover to make it look like a grand piano. The book comes with three replaceable long-life AG-13 batteries and conforms to the safety requirements of ASTM F963-03. If you have any questions about this product by Publications International, contact us by completing and submitting the form below. If you are looking for a specif part number, please include it with your message.